As per Food and Agriculture Organization of the United Nations, over 800 million population of world are chronically undernourished and suffer due to scarcity of food. Climatic changes, scarcity of water and severe weather condition negatively impacts the agricultural production. As per United Nations, agricultural production must be increased by 50% by 2050 so that worldwide food demand will be fulfilled. Rising internet penetration and adoption of technology driven solutions are expected to bring prosperous growth for agriculture industry. Government is also actively initiating projects and activities to create awareness and to improve the agricultural development. For instance, European Union has invested over USD 26 billion for rural development and implementation of modernized farming under 7 years plan. In 2017, with an investment of USD 35.4 million, European Commission introduced a project “Internet of Food & Farm 2020 (IoF2020)”. This project aimed for innovative research and implementation of IoT based solutions to improve agricultural production in the region. Acquisitions and partnerships between public and private sector are promoting investment for implementation of internet of things (IoT) in agriculture and technology based agriculture projects. For instance, in 2016, European Union invested around USD 100 billion for rural development of Europe region and improvement of agricultural technology. Moreover, the U.S. Federal government invested over USD 500 million on sensors to introduce GPS-guided agricultural devices for planting and harvesting crops. Such agriculture projects are likely to enhance the adoption rate of connected technologies by farmers in agriculture industry. 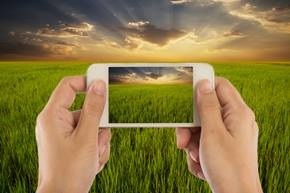 Growing demand for advanced agricultural techniques is supporting adoption of IoT in agriculture. The global IoT in agriculture market valued USD 4.40 billion in 2015 and is projected to grow at CAGR of 28.30% during the forecast period. North America is the dominating region for IoT in agriculture market and accounted for around 75% market share in 2015. Leading US based tech giants invested over USD 1o billion into farm business network to expand their product portfolio in North America region. North America IoT in agriculture market value is expected reach USD 20.1 billion by 2024. Europe IoT in agriculture market valued USD 5.8 billion in 2016 and is anticipated grow at a notable CAGR of 7.50% over the forecast period. Countries such as Greece, Spain, Poland, France and Scotland have already implemented IoT based solutions in agriculture to increase the trade value of food sector. Moreover, Countries such as China, Japan, Vietnam and India has high adoption rate of precision farming which is expanding the IoT in agriculture business in the region. Asia-Pacific IoT in agriculture market is expected to grow at a CAGR of 19.28% during the forecast period. Implementation of precision agriculture technique helps in high yield production with optimizes resource utilization. Implementation of advance technology helps in less energy consumption and saves water resulting in the enhancement in productivity. Smart irrigation has reduces nearly 15% of water consumption. Lack of access to internet and connected services in agriculture majorly in developing economies is hindering the growth of IoT business in agriculture industry. Agriculture sector requires efficient management of data which is a major challenge as application of IoT in agriculture is still in its embryonic phase. Deployment of large scale IoT based projects in agriculture is difficult as this market consist of startups. Leading IoT companies are providing very limited application of IoT in agriculture which reduces the adoption of smart technologies by farmers. Latin America region is extensively covered with natural resources and have plethora of fertile ground which can provide immense opportunity for IoT in agriculture market in the region. However, lack of internet penetration and availability of advance connected devices may hinder the market growth. Nearly 50% of Latin America population uses internet out of which 60% of population are from Brazil and Mexico.